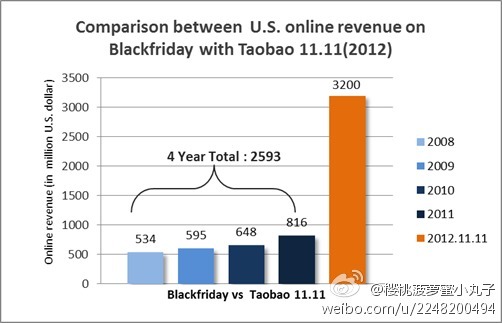 Qing (Matt) Zhang's technical blog: Taobao's big data rocks! Taobao, the Chinese version of Amazon, hit a record $3.2B online sales revenue in a single day on 11.11.2012 (the so called "singles' day" by the look of 11.11), which tops the sum of the black Friday sales in the US of the past 4 years! At the same time, Alipay, the Chinese version of Paypal, reported 4.1B transactions, 28.4B SQL queries, 15.TB log, 193.1B visits to in-memory data blocks, and 1.3B physical reads, also in the same day. A quick study tells us that Taobao uses MSSQL clusters for transaction processing, and they designed their own Hadoop-based data analytics platform called OceanBase. Alipay also uses MSSQL clusters as the core foir their transaction processing.